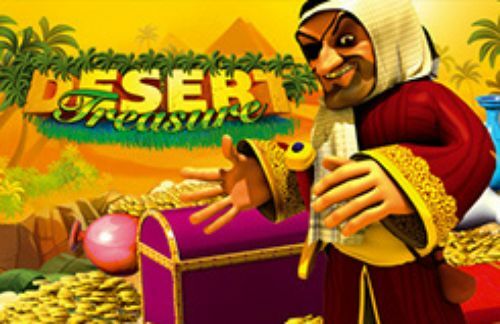 Arabian Nights is one of the most popular jackpot games in the world. It comes from NetEnt and boasts of ten paylines working across three rows and five reels. The game has a wealth of well-paying symbols. The most lucrative is the man with the turban who is holding a diamond. This symbol is the Wild and it landing in four instances pays 2500 on the line bet, but seeing five pays the game's jackpot prize. 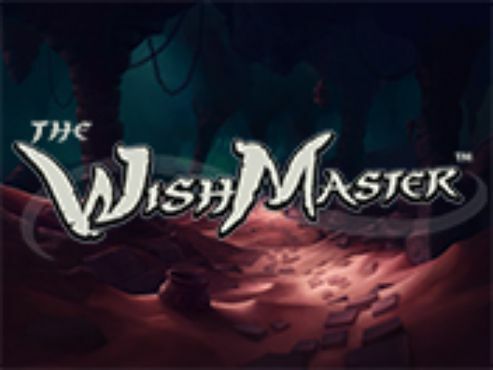 The lamp (of the genie) works for the free spins and it is a scatter as well. 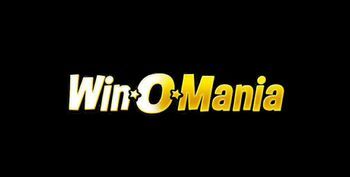 The players can get up to 15 free spins, during which the winnings get a 3x multiplier. The jackpot prize of 5000 pounds is there for the luckiest players to claim by getting five wild symbols on the reels. 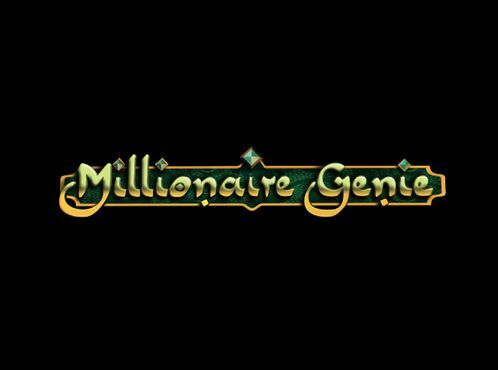 Net Entertainment never failed to surprise its players, and neither it did this time with this new fantastic game called Arabian Nights. 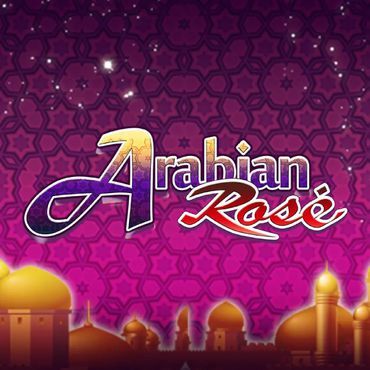 According to the name you can guess what this game is all about - Set in the Islamic time from 9th to 13th century, it is all about the Arabic Prince, the gems and everything that reminds you of that culture when someone mentions it. It is set on a night where you spin the reels positioned in the middle of the screen while in the back we can see their traditional houses with round roof just like in the Aladdin story. The sound takes you back in the deserts where the Arabians roamed in that time and devastated everything in their paths while riding camels. Let’s take a look at the gameplay. 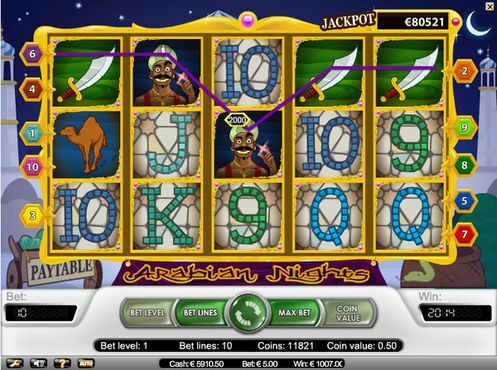 Arabic Nights is five reels 10 paylines video slot game that focuses on the base game as well as the progressive jackpot to give its players lucrative wins. 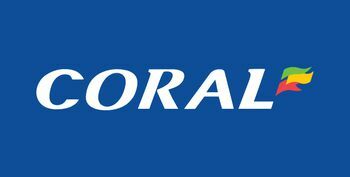 One of the rare games where you cannot adjust the bet, and can only be played with £5 per spin because of the progressive jackpot. The “Max Bet” option is here to give each player a satisfying result and perception of the game, and you can also choose the number of paylines that you can play with. Although this is an option we strongly suggest you play with all 10 paylines for maximum chance of a win and faster rising of the progressive jackpot. The symbols of the game are all related to the Arabic culture. They are divided into two categories – lower and higher symbols. The lower symbols are inspired by cards, and they start from the 9 and go all the way to the Ace. They are made of glass which is put on a stone and look awesome. The higher symbols, on the other hand, are inspired by the objects that closely describe the Arabs. We can see a Red Hat, a Camel which they used to travel around, a Sword typical for that time and place of the world. We can also see a golden lamb and a pair of shoes with the end going up and back towards the leg. There is also a tent typical for the Arabs. The Lamb is the scatter symbol of the game, and not only that it activates the bonus feature of the game, it also awards bit time. Three Scatters result with 5x, four scatters with 20x and five scatters award amazing 500x your stake. The bonus feature is triggered by three or more Scatter Lamb symbols, and everything you win in this game gets multiplied by 3x. This is basically the bonus game and while it’s nothing special except the free spins and multiplier, that’s not what the game focuses around. Take a look below. 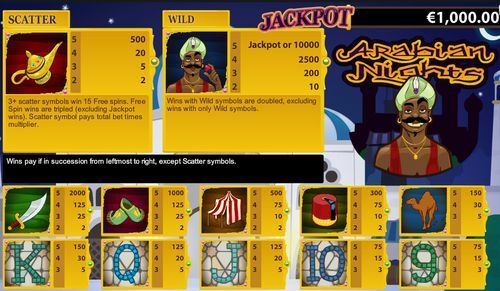 Arabian nights focuses around a progressive jackpot that slowly builds up when a player wins a prize. If you want to win it, you need to land five Prince symbols on a payline with the maximum bet stacked. You can still win 10,000 coins if you play at lower bet. As we see from the records, the latest jackpot won from this game is amazing £2.75 million so test your luck and give this game a shot!